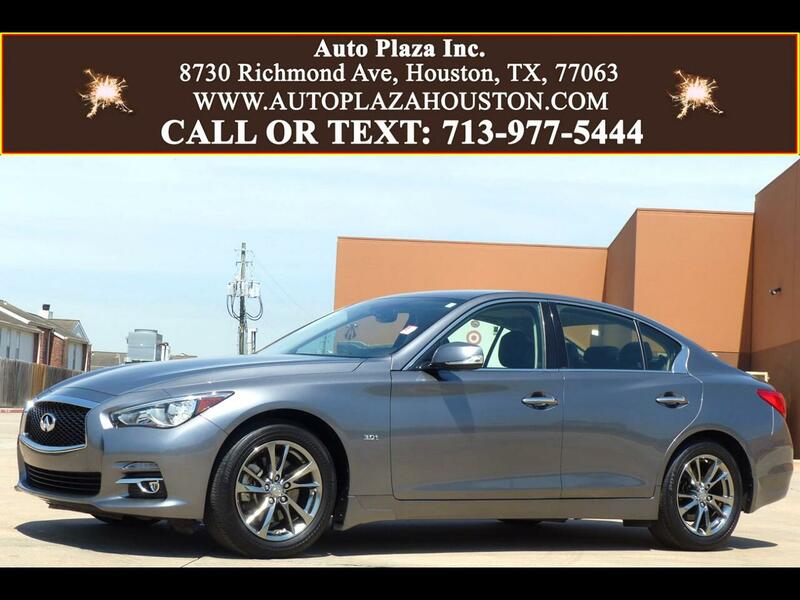 Used 2017 Infiniti Q50 3.0t Signature Edition for Sale in HOUSTON TX 77063 Auto Plaza, Inc.
*-* Great Deal on a Low Mileage Q50!! *-* With Remaining Factory Bumper to Bumper Warranty Good Thru 03.09.2021 or 60k Miles! PRESENTING this Sporty Low Mileage 2017 Infiniti Q50 3.0t Signature Edition Sedan with a slick 7 Speed Automatic Transmission with Sport Mode and Rev Matching Manual Shift Mode! Options include, Navigation, Power Sunroof, Rear View Camera, 17' Wheels, Driver Mode Select Function, Push Button Start, LED Headlights, LED Taillights, Paddle Shifters, 2 Touchscreens, Infiniti InTouch Apps, Bluetooth Handsfree, CD/MP3 with USB Port, iPod/iPhone integration, XM Radio, Power Leather Seats, 50-State Emissions, Audio and Cruise Controls on Leather Steering Wheel, Automatic Dual Zone Climate Control, Power Tilt and Telescopic Steering Wheel, Traction Control, Driver and Passenger Airbag, Power Windows, Power Locks, Power Mirrors, and Much More!! This car features Infiniti New InTouch infotainment system that takes the form of two active touchscreens!!! So, CALL TODAY to Schedule a TEST DRIVE! Financing Available!